E verything a beginner needs in a serger is in the Brother 1034d. The ability to create hems, overcast raw edges, finish seams, and trim excess fabric. You also get an accessory kit which includes supplies and replacements that will keep you going for a while. 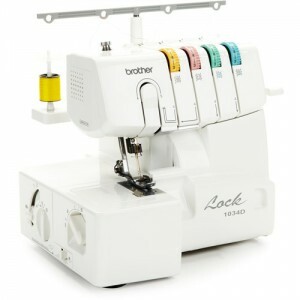 If you are on a budget, you will be happy to hear that the 1034d is the most affordable overlock machine on the market. It has been the #1 serger on Amazon for years too because it is a popular choice with novices and experienced tailors alike. It has a 3 or 4 thread capacity that can create perfect seams while trimming and edging any fabric to give it a neat and professional finish as you work. It is also extremely capable working with with light, stretch, and heavy fabric projects. This serger is very versatile. Complete newbies or beginners can easily convert from flatbed to free arm for circular sewing (like hemming you pants) and also choose from a wide selection of stitches, from plain stitching to decorative with ease. Accessories: sewing machine cover, tweezers, four thread nets, hexagonal driver, foot control, lint brush, needle set, four spool caps, and operational manual. For such an inexpensive machine, the 1034d comes with a lot of versatility, Included are 22 stitches such as narrow hem, ribbon lock, 4 thread, rolled hem, and 3 thread overlock. Additionally, the stitch width is adjustable from 5 to 7 millimeters with a simple adjustment directly to the left of the needle. Threading is a breeze with the 1034d’s color-coded, easy-to-follow lay-in threading system. The handy lower looper is especially designed to ensure that threads stay in place. The 1034d is the best serger for beginners because it is easy to use and won’t break the bank. Achieve quality stitching with the 1034d’s differential fabric feed (ratio of 0.7 to 2.0 millimeters) on practically all fabric types. This feature is especially critical when sewing knitted, and thin fabrics. Thankfully you don’t need to buy special needles because this model uses the same standard needles for home sewing machines. The stitch speed the Brother serger 1034d delivers is an amazing 1,300 SPM (stitches per minute). This will save you a ton of time when working. Once you get the hang of it you will be flying from project to project. This serger has an adjustable presser foot that provides consistent pressure to ensure quality stitching on both light and heavy fabrics. Loosening the pressure for lightweight fabrics prevents puckering to enable easier curve sewing and the knife’s adjustable on and off mechanism enables easy flat locking and pin tucking. The built-in handle makes the Brother 1034d easily portable. It comes with a soft cover, a printed English/Spanish bilingual operational manual, an accessory bag with four spool nets, cleaning brush, trim trap, needle set, hexagonal wrench, and tweezers plus an instructional video on CD and a 25-year limited warranty. The 3 or 4 thread options and fast threading system makes this machine a delightful beginner serger that you can use to create ruffles, gathers, and decorative edges, join laces, serge spaghetti straps and narrow sleeves on many kinds of fabrics like linen, formal wear and knits. Beginners will be thrilled to create professional-looking home décor, bridal wear, reinforced applications, formal apparel, heirloom pieces, and crafts with 22 varieties of built-in stitch functions. for projects requiring rolled and narrow hems, 4-thread overlock, ribbon locks, and 3-thread overlock. If you’re a professional sewer or tailor, sewing with a serger like the 1034d’s differential fabric feed can give you a wide berth to do your most creative projects even on fabrics that are stretchy or thin. No fussing with needles either because this model uses those standard ones for home sewing machines. Learning is easy with the 1034d because it comes with a printed operation manual and an instructional CD video, both in bilingual editions. Numbered and color-coded upper and lower loop threading, as well as a foot controller and two snap-on feet, make sewing totally enjoyable. Conclusion – Best Serger For Beginners? Customer satisfaction with this particular model (www.grandmalikestosew.com/brother-sewing-machines-outstanding-value) is overwhelming Customers are in love with the 1034d and rave about its very affordable price for its numerous features. Should you buy the 1034d? The excellent customer reviews say it all: with the 1034d, sewing with a serger just became easy, convenient, and fun. The “cons” have been considered minor even by customers who wrote them. 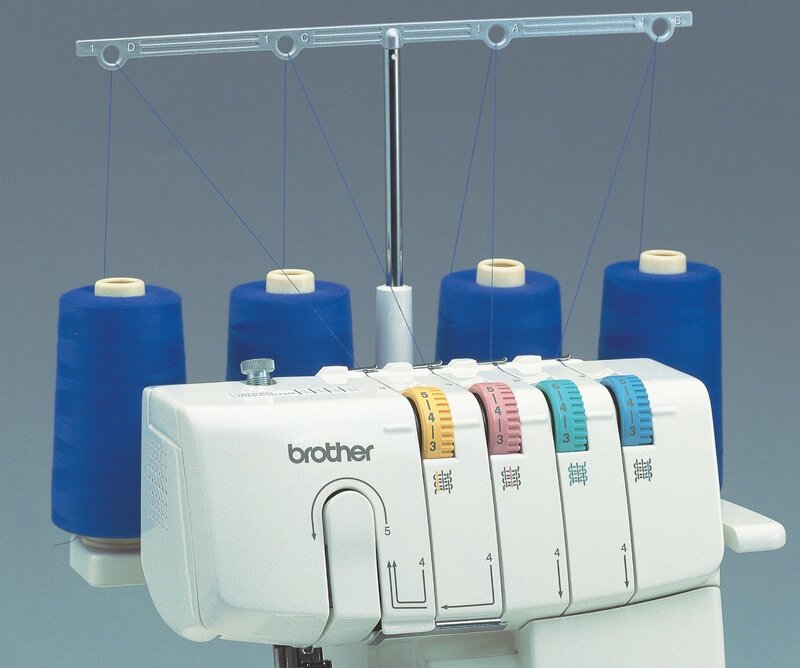 Yes, get the Brother 1034D 3 or 4 Thread Serger now , you won’t regret it. AS a Mac owner I emailed Brother and found out you can watch their instructional videos on youtube–so don’t let that stop you or hold you back from this great serger. I Love my Brother serger, its awesome! Great price and super easy to operate.